The Chosen were the caretakers of the Ellcrys. At each new year, all Elves who had reached maturity in the prior year were brought before the Ellcrys. They passed beneath her limbs, pausing momentarily to see if she would accept them. Those the tree touched on the shoulder would become the Chosen for the year. Once a Chosen was selected, they were in service to the Ellcrys until the year was done. Each morning, at sunrise, one Chosen would greet the tree by placing their hands on the bark of the tree and speaking the words of greeting. Feeding and grooming the tree. General upkeep of the Gardens of Life. Since the creation of the Ellcrys, there had always been Chosen to care for her. 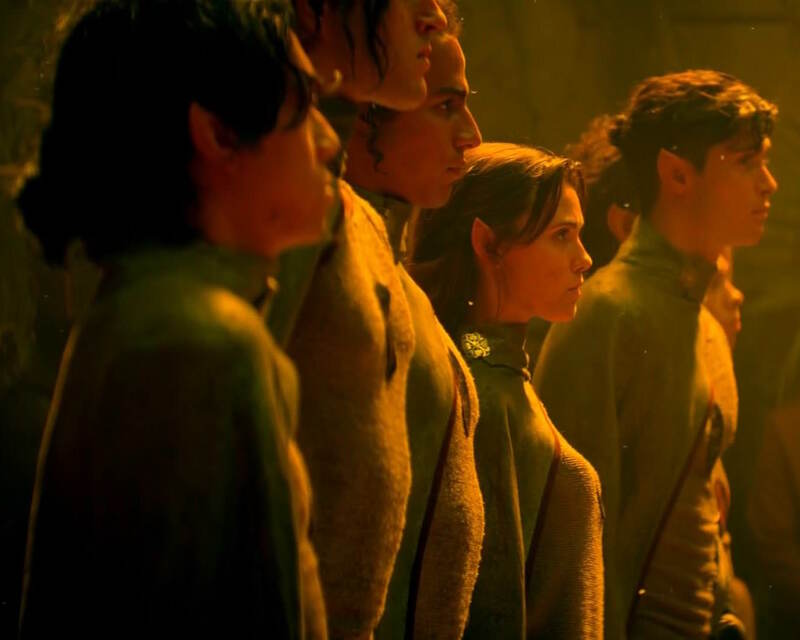 It was a tradition of service that was handed down through the generations that the Elves considered both a coveted honour and a solemn duty. At the time Amberle Elessedil was selected as a Chosen, there had been no female Chosen for 500 years. On their 230th day of service, the Chosen entered the Gardens of Life to greet the Ellcrys as they did every dawn. Most of them were chattering to themselves, except for Lauren who was troubled because he thought he had seen some signs of wilt on the Ellcrys the night before. When the other Chosen heard this they were disconcerted, with at least one of them blaming Amberle Elessedil. After a discussion they resumed their walk into the Gardens. When they arrived at the Ellcrys, Jase offered Lauren his turn at greeting the tree to attempt to cheer him up. As Lauren went to greet the tree, he looked up and saw there actually was damage to the tree. He called the other Chosen over who were all shocked when they saw the extent of the damage. With dawn approaching Lauren remembered that he needed to greet the tree and he placed his hands on the bark. Immediately, the Ellcrys started to speak to him and asked him to have the other Chosen come to her. A branch reached down to clasp all of them and she began to speak to them all. She confirmed all the legends were true, that the evil was contained beyond a Forbidding that the Ellcrys maintained and only she kept the Elven people safe. She also told them she was dying. Appeared in the background while Walker Boh and Allardon Elessedil were talking. The Gauntlet was a half-mile race that took place at the dawn of the new year. The first seven to cross the line became the Chosen. The race was performed blindfolded and with the contestants’ arms tied behind their backs. Contestants would do anything to win, including knocking over and treading on their opponents. Spectators would gather near the finish line and count in the winners. After the Chosen are selected, they are brought in – still blindfolded – and presented to the King and the Ellcrys. Their blindfolds are then removed to reveal their identities. Next they approach the King, the previous Chosen would remove their robes and place them on the new Chosen. The King then congratulates the new Chosen and recounts the story of the Ellcrys to remind the Chosen of their responsibilities. Once that was done, the Chosen would approach the Ellcrys one by one to place their hands on the tree and be accepted as a Chosen. A celebration would be held later in the night. No female had run the Gauntlet in 500 years. Amberle Elessedil was the first to do so, completing the race to become the seventh and final Chosen. Lorin took first place.